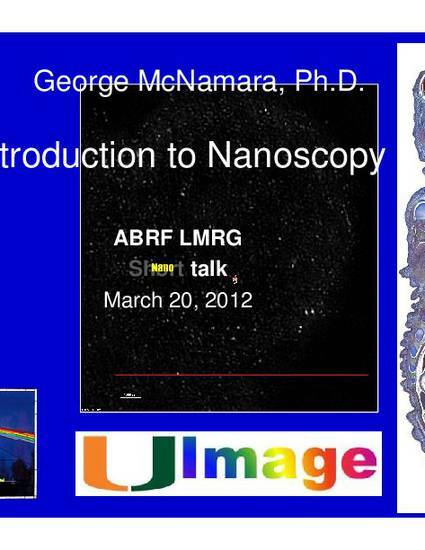 T7-1 is the designation for the LMRG Nanoscopy session at ABRF in Orlando, FL, on March 20, 2012. The PDF file here is a draft of my presentation. May not be very helpful since (1) would probably help to know what is in my head and each slide will [hopefully] prompt me to say, and (2) 10 minute talk so I am going to push the "next slide" button after saying very little. The T7-1 Introduction to Nanoscopy Nano Talk is copyrighted (c) George McNamara, 2012. Except for (1) screenshots from research articles (which are copyrighted by the publisher or author, here on academic "fair use" exemption), letter from Mr. Goetz (of which I am the addressed recipient - plus, free marketing for b-halle.de), and the data table on multiple half and whole Lambda wavelengths for excitation and depletion - data are facts, facts cannot be copyrighted (see this web site for the entire Excel file).